Enjoy this simple, delicious, and gluten free dish that is loaded with goodness. This recipe is a perfect side dish for your next summer picnic or back yard cookout. You can serve this recipe at room temperature or chilled. For your next holiday meal, make this recipe in advance so you can spend your final minutes focusing on the main course. This dish will will last for several days in the refrigerator and will take on even more flavor as it sits. Make this recipe one evening and pack it for lunch for multiple days to come! 2. Heat 2 teaspoons oil in a large saucepan over medium-high heat. 3. Add shallots to pan. Sauté shallots for 2 minutes or until tender. 4. Add 2 cups water, wine, and salt to pan; bring to a boil. 5. Add quinoa; cover, reduce heat, and simmer 15 minutes or until liquid is absorbed and quinoa is tender. 6. Remove from heat, set aside, and let cool. 7. Combine remaining 2 tablespoons olive oil, lemon juice, and pepper in a large bowl; stir with a whisk. 8. 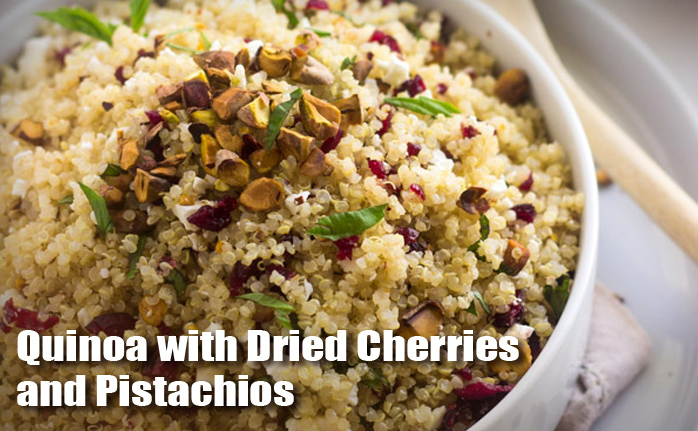 Add quinoa, cherries, and pistachios. Toss gently to combine. Quinoa also contains almost twice as much fiber as most other grains. Fiber is most widely known to relieve constipation. It also helps to prevent heart disease by reducing high blood pressure and diabetes. Fiber lowers cholesterol and glucose levels, may lower your risk of developing hemorrhoids, and may help you to lose weight (it takes a longer time to chew than does other foods because it makes you feel fuller for longer and is less “energy dense,” which means it has fewer calories for the same volume of food). Not to be overlooked, quinoa contains a great deal of iron, lysine, magnesium, manganese and riboflavin (B2). B2 improves energy metabolism within brain and muscle cells and is known to help create proper energy production in cells. Snacking on pistachios may help lower your cholesterol. Study participants who consumed a low-calorie diet with either 10 percent of their total calories or 20 percent of their total calories in the form of pistachios for four weeks lowered their cholesterol more than participants who followed the Step 1 diet for lowering cholesterol, according to a study published in the "American Journal of Clinical Nutrition" in September 2008. Pistachios also contain l-arginine, which can make the lining of your arteries more flexible and make it less likely you will develop blood clots that could cause a heart attack. Vitamin E is also plentiful, which makes it less likely your arteries will become clogged with plaque. The fiber content of pistachios may make them more filling, helping you to eat fewer calories later in the day. Although most of the fat in pistachios is the healthy unsaturated type, they still contain a considerable amount of calories, so they should be eaten in moderation. Also, choose pistachios that are unsalted to help minimize your salt intake. Add dried cherries to your diet and you'll also boost your intake of vitamin C. Each quarter-cup serving contains 8 milligrams of vitamin C (that's 11 and 9 percent of the recommended daily intakes for women and men, respectively). Vitamin C boosts collagen production, so it contributes to tissue strength, and it protects you from free radicals. Getting enough vitamin C in your diet also supports new tissue growth and aids in wound healing after injury. Dried cherries also come packed with beneficial vitamin A. The vitamin A in your diet supports new cell growth, and plays a role in wound healing and immune function. It also supports health vision and nourishes your skin. Each quarter-cup serving of dried cherries boasts a vitamin A content of 1,132 international units. This makes up 38 percent of the recommended daily intake for men and 49 percent for women.